The bare-eyed cockatoo is a slightly smaller member of the cockatoo family of parrots, and it is one that is somewhat easier to keep as a pet than its larger cousins. The ring of blue around the eyes gives these birds a slightly sleepy look, but these birds are actually quite social and active, much preferring to be out of the cage and interacting with their owners. The bare-eyed cockatoo may not be the most colorful parrot in the world, but it more than makes up for it in personality. Sweet, playful, and intelligent, bare-eyed cockatoos are becoming more and more popular as pets. While cockatoos, in general, are among the more difficult birds to keep, due to a reputation as a "velcro bird" (sticking to their owners), if you have the time and determination to provide your bird with plenty of attention, you will have a wonderful companion. The bare-eyed cockatoo also goes by the names little corella cockatoo, and blue-eyed cockatoo. The taxonomical name for the bare-eyed cockatoo is Cacatua sanguineat. It was described and catalogued by English ornitholigist John Gold in 1843. In the wild, four subspecies have been identified: C. s. sanguinea, C. s. normantoni, C. s. transfreta, and C. s. gymnopis. This white cockatoo is native to Australia and southern New Guinea. In the wild, the preferred habitat ranges from arid deserts to coastal plains, but these birds are rarely found in thick forests. Bare-eyed cockatoos are often found in urban areas and agricultural zones, and may be so prevalent that they create a nuisance. The bare-eyed cockatoo is normally between 14 and 16 inches long from the beak to the tip of the tailfeathers. In captivity, bare-eyed cockatoos can live for up to 50 years, and beyond in some cases. They are, however, susceptible to some diseases that can shorten their lives. With a reputation for being goofy and clownish, the bare-eyed cockatoo is normally a very social bird that loves to play and interact with its owners. Intelligent and friendly, bare-eyed cockatoos make excellent pets for experienced bird owners who would like a cockatoo but don't have the space to keep one of the larger species. Among the cockatoos, this species is the best at mimicking human speech. It is common for a bare-eyed cockatoo to spontaneously mimic the vocal patterns of every member of the family. Bare-eyed cockatoos are primarily white with touches of salmon-pink on their faces. They have horn- colored beaks and bare, gray-blue patches around their eyes. Males and females are identical, though males are slightly larger in stature and also have slightly larger eye patches. 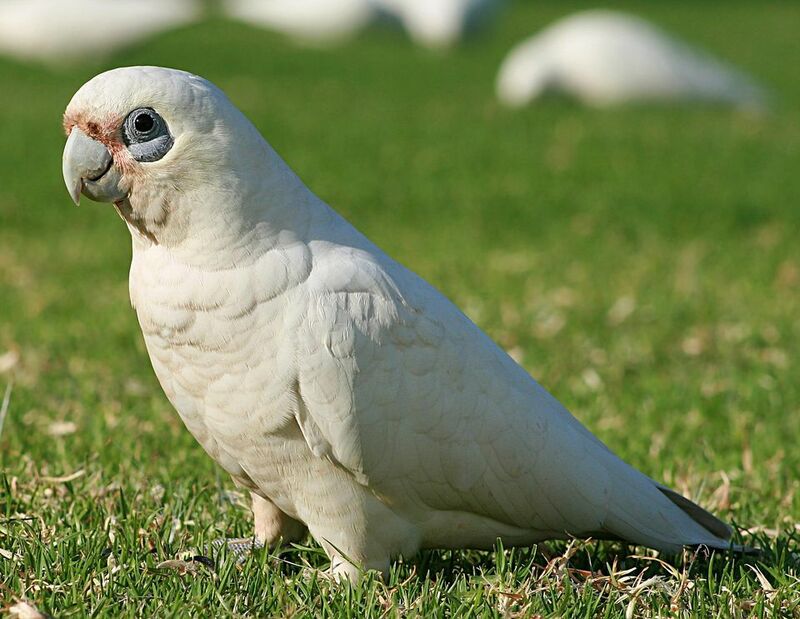 Although the bare-eyed cockatoo is a little less demanding than larger cockatoos, this is still a bird that is best suited for an owner who wants a constant companion. These birds crave social interaction with their owners and can resort to destructive behaviors if they feel neglected. Make sure that you have plenty of time to spend with the bird before bringing a bare-eyed cockatoo into your home. As with all birds, the larger the cage the better. But even with a large cage, your cockatoo will need plenty of time outside the enclosure for play, exercise, and attention from you and your family. You serve as this bird's flock, and your bare-eyed cockatoo will insist on interacting with you. All cockatoos require regular bathing to keep their skin healthy and their plumage shiny. Carefully dry the birds in a warm room after bathing them. If you clip the wings, do so only on the primary feathers so they can easily fly and glide around the house. These birds will prefer to be out and about rather than remaining confined in their cage. Cockatoos are prone to weight gain, so they should be fed a diet low in fat. (Fatty-liver disease can result, otherwise.) Offer your bare-eyed cockatoo a fresh vegetable mix that includes leafy green produce, as well as root vegetables. Fresh fruit is a welcome and healthy addition to their diet, as are nuts such as almonds and walnuts. A formulated pelleted diet should also be on hand and available to your cockatoo. Of course, fresh drinking water should be available at all times as well. Bare-eyed cockatoos, like all cockatoos, need plenty of exercise. If you want to keep this bird, make sure that you're able to give it a minimum of 3 to 4 hours of supervised playtime outside of the cage each day. On top of needing a chance to exercise and stretch its wings, your bare-eyed cockatoo is a very social bird that needs daily time with its owners in order to thrive and remain happy. Providing toys to these birds is very important, and teaching them that toys are a fun part of their lives will make a huge difference for both your bird and for you. A cockatoo needs to learn to play independently, and toys and activities that it can manage on its own will reinforce your bird's independence, as well as giving you some much needed time off. Wooden toys, as well as toys made of leather and sturdy hemp twine or plastic rope, will give the bird an outlet for using its substantial reserves of energy. Ladders and swings will also help to mentally engage your cockatoo and provide it with needed exercise. Cockatoos are highly susceptible to psittacosis, a disease caused by the bacteria Chlamydia psitttici. Symptoms include lethargy, a discharge from the eyes, and respiratory problems. Your bird will require antibiotics if it contracts psittacosis. Nutritional deficiencies are also common with cockatoos and can be prevented with vitamin supplements. The most common problems with cockatoos, however, are general malaise and behavior problems that occur when birds don't receive enough attention and interaction with owners. Destructive behaviors and feather pulling are clear signs your bird needs more attention.